Marrakech is one of the busiest cities of the Kingdom of Morocco and maybe the quickest way to escape Europe – to enter a complete different world. 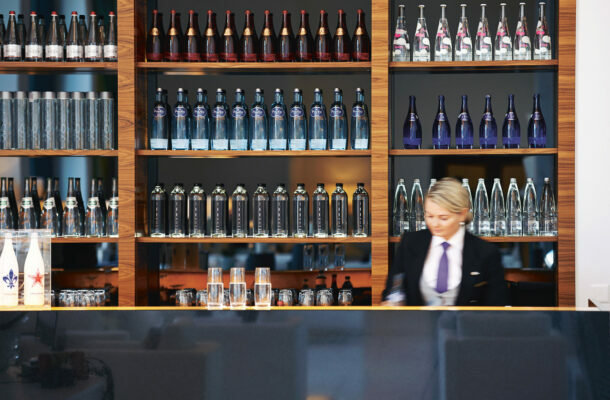 Only a three hour flight away, a brand new and chic airport awaits you in Morocco. 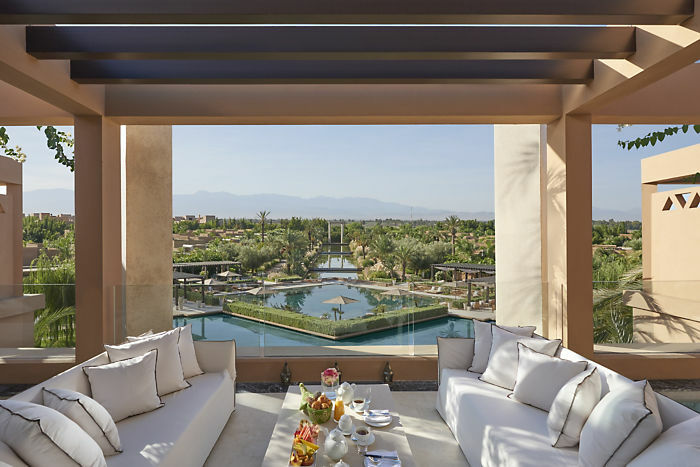 After a 15 minute drive from the airport the Mandarin Oriental Marrakech welcomes you in the most luxurious and minimal-chic way. Located in the North of the foothills of the snow-capped Atlas Mountains, build by the by Berber Empires, the Jetset destination Marrakesh comprises an old fortified city packed with vendors, stalls and busy market places. 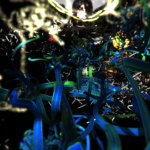 It also embraces modernity. Contemporary art galleries reside among 14th century palaces and you can find Avantgarde concept stores next to flying carpets. 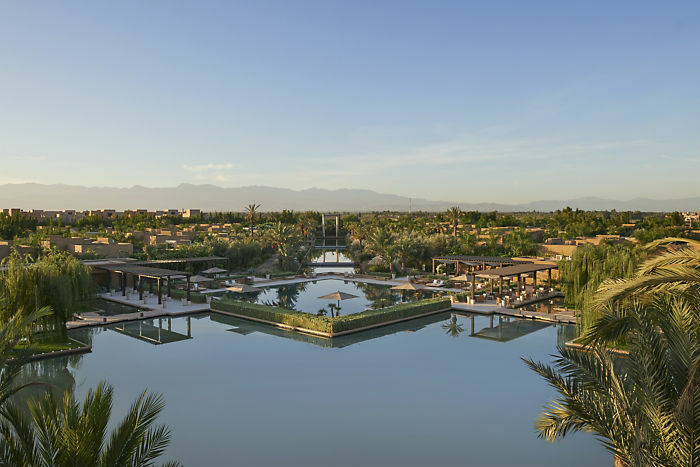 The Mandarin Oriental, Marrakesh is a very good example of „Marrakech TODAY“: a relaxed luxury oasis for cosmopolitan travelers. 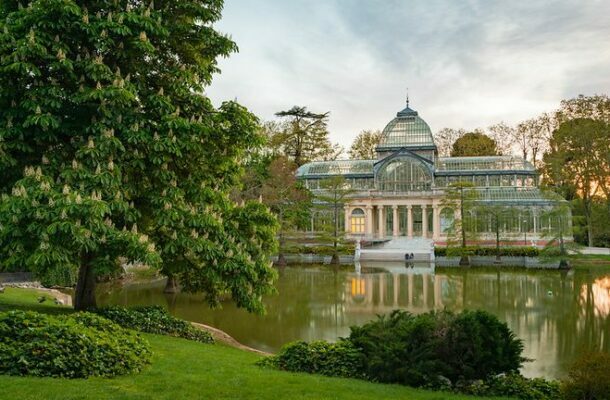 Parisian architect Pascal Deprez conceived the 50-acre property. 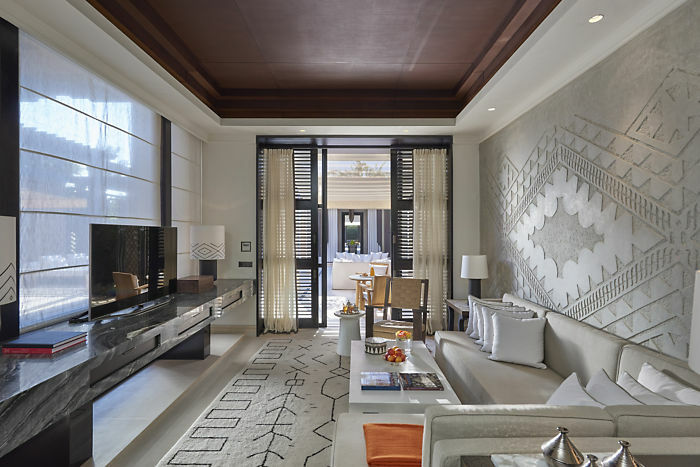 The Interior designer couple Patrick Gilles and Dorotheé Bossier carefully fused Morocco’s cultural diversity with Eastern and Western touches, balanced geometric influences frpm Berber arts and craft with Andalusian sense of scale and perfect symmetry combined with MO’s signature palette of cream and mahogany. 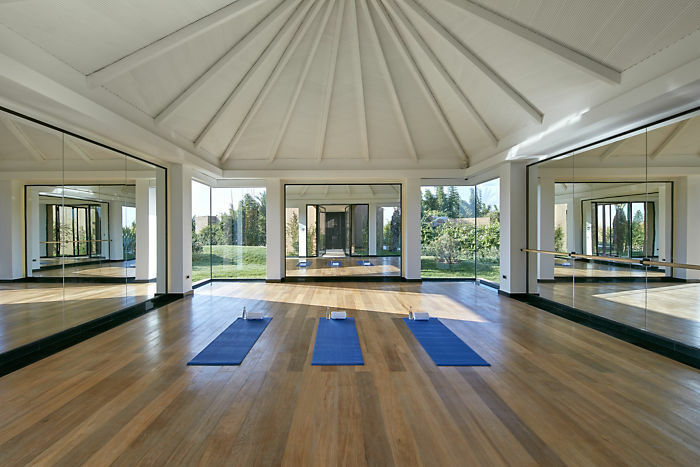 A very chic french twist, that simply created a modern palace of serenity and style. Set among 20 hectares of landscaped olive groves, nestled between two golf courses, the 2015 established resort is a modern jewel of the Kingdom. 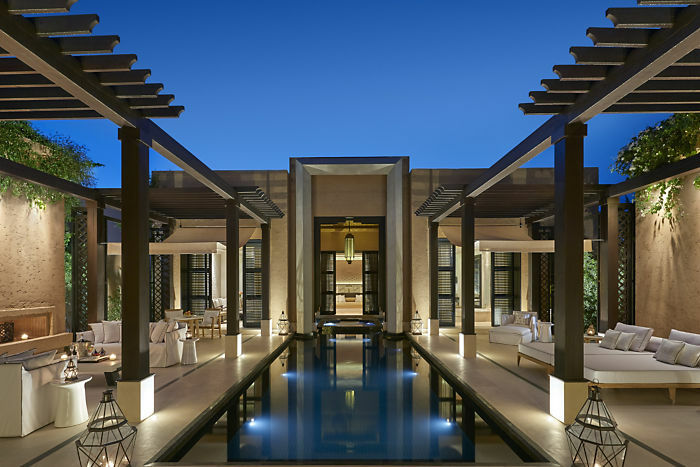 The Mandarin Oriental Marrakech offers 54 private villas, that in fact are contemporary „mini riads“ where the outside space is as important as the inside. The resort owns a stunning pool, acres of space for sunbathing and relaxing, an open fire place for romantic hours and shaded alfresco dinning areas. 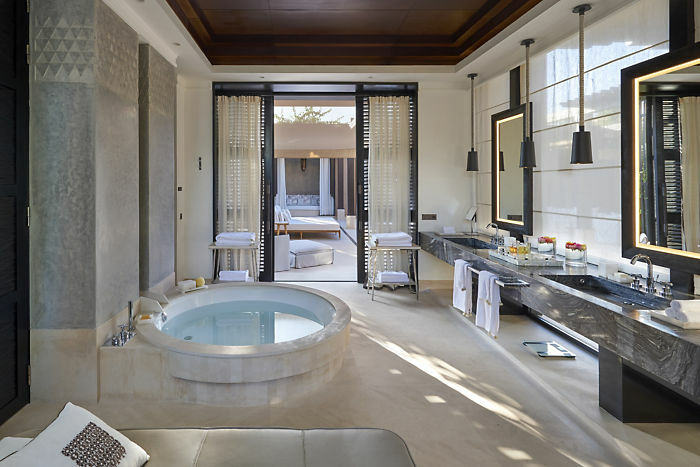 Each villa has a fully equipped kitchen and a dreamy, light filled bathroom, including a private mini hamam, circular bath, vanity areas and a large walk-in closet. 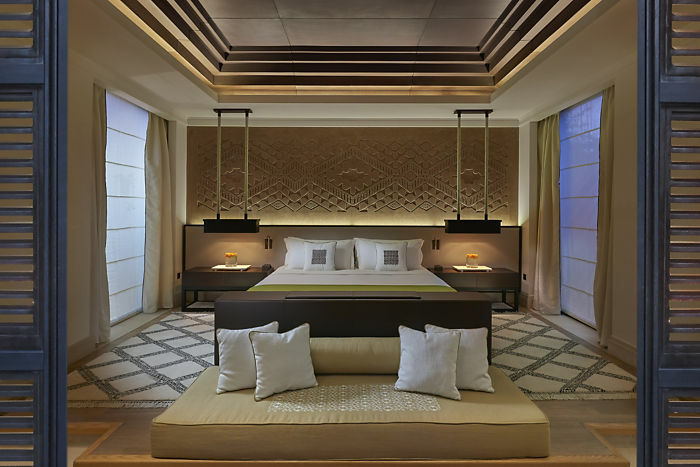 In the heart of the villa a sumptuous master bedroom integrates sophisticated decor with the latest in modern technology such as a discreetly hidden television and a lightning control pad. 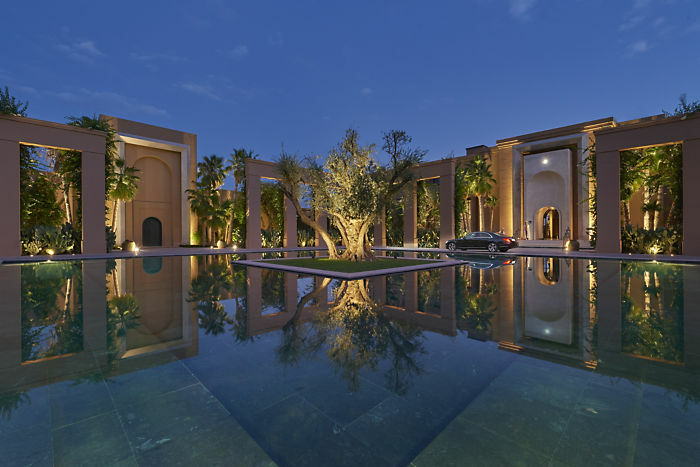 You see, there is no need to ever leave your villa or the hotel at all, when you have three restaurants, indoor and outdoor pools, modern Moroccan cuisine cooking classes with Bocuse trained chef Meryem Cherkaoui, an organic vegetable garden and a world-class spa around. What else can you wish for? Shopping maybe: the small boutique offers the worlds most delicious silk caftans (…you will never regret buying one. It’s a real fashion statement and so easy and classy to wear) traditional shoes, the babouche and a fine souvenir selection. 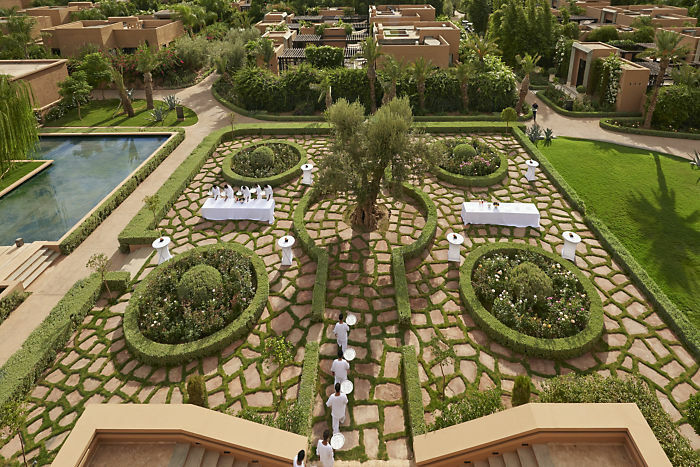 The garden… is a love story for itself:feathery grasses, centuries old olive trees and an ocean of 100,000 divine smelling roses will take you directly into a relaxed state of mind that honors the beauty of nature. Also, from a culinary perspective, the hotel offers great taste. 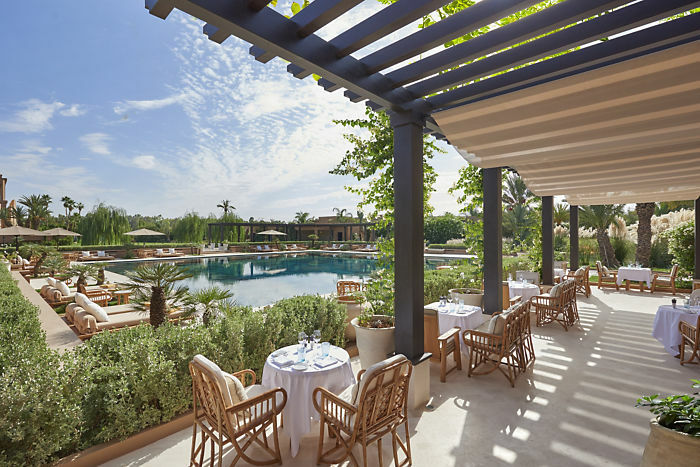 The breakfast is held as a buffet in the „Salone Berbère” with a picturesque view overlooking a large mirror like pool and the snow capped Atlas Mountain, the terrace is perfect for the first sun rays, the chic and easy lunch is served at the pool garden – set around the main swimming pool beneath a shaded bougainvillea pergola. „Mes’Lalla by Maryam Cherkaoui serves traditional Moroccan signature dishes with a Parisian twist and contemporary take. The „Ling Ling by Hakkasan“ is a culinary party hot spot, that blends international feeling and offers a creative twist to the renowned Hakkasan DNA. 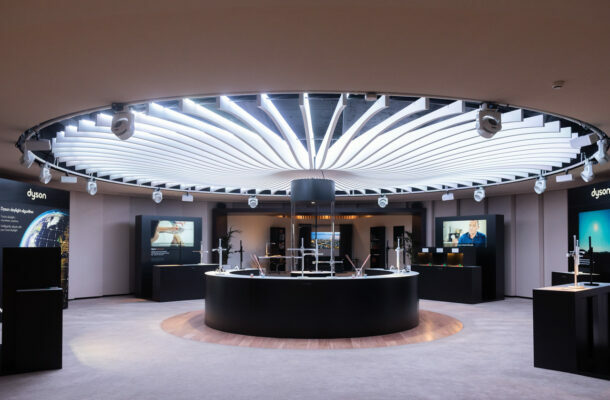 Innovative cocktails, beautifully prepared Cantonese dishes and an electric soundtrack are attracting an international crowd as well as locals. 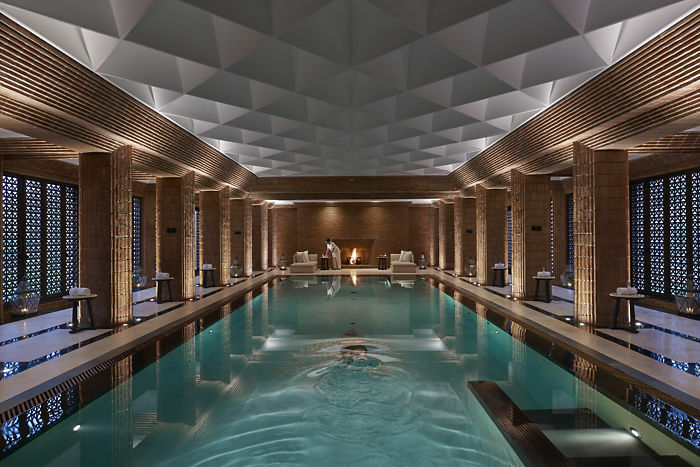 The spas carrying the Mandarin Oriental emblem have proven their worth and reputed to be part of a holistic approach of regeneration in line with a philosophy of emotional well-being. 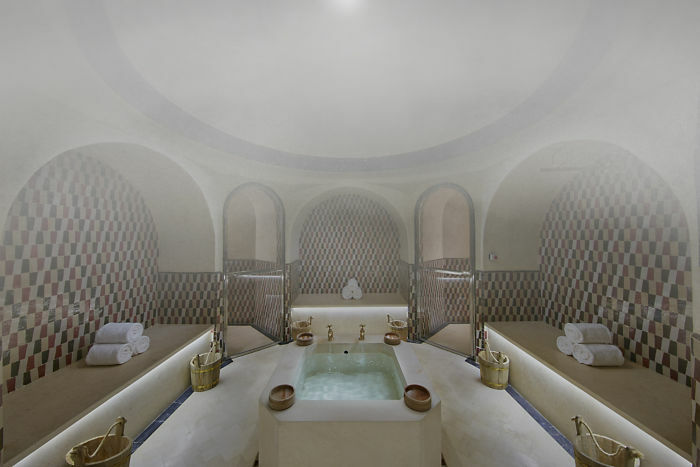 The „Spa Mandarin Oriental, Marrakesh“ is a sanctuary of well-being, a temple that features six treatment rooms, including two suites with own gardens and two luxurious hamams, a state-of-the-art fitness center, a yoga room and an indoor swimming pool. 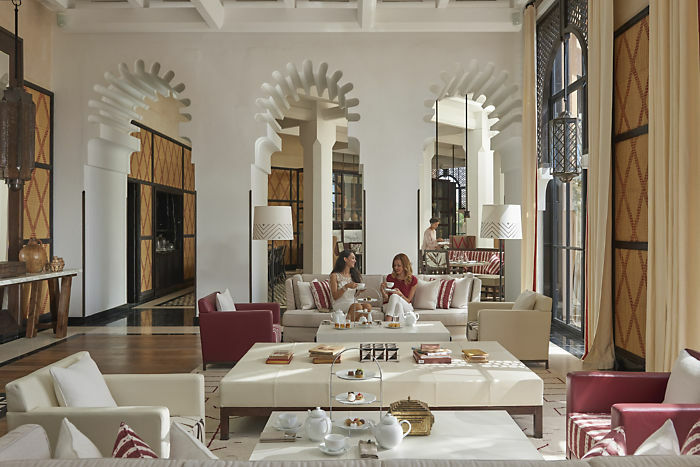 Oriental principles applied Moroccan Traditions will transport you directly into a blissful nirvana – make sure to book the „Traditional Hamam“ to clean the body and mind with a black soap. So, if you want to fall in love with Africa, need a luxury escape with another culture or planing a secret and super private „no paparazzi“ get away with yourself or with a lover ( pls. 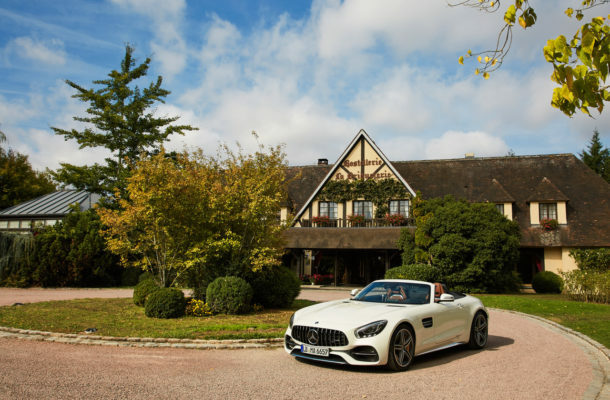 make sure to book the tantalizing „Romantic Escape“ package) or your extended family including friends from all over the world – this is the place where the legendary „Mandarin Oriental Magic“ happens.